-Accurate | Reliable | Engaging – Accurate content and assignments that you can count on. Reliable content that is current and reflects new accounting rules. Engaging content that employs cool, entrepreneurial companies along with sustainability topics that motivate the learning of accounting. -Innovative Learning Framework makes it quick and easy to manage your course. The unique CAP (conceptual, analytical, procedural) framework identifies learning objectives, textual materials, assignments, and test items by C, A, or P, allowing you to easily customize your course based on personal preferences and/or department objectives. -Decisions using Accounting Data – Practitioners assert that decision-making is increasingly important as Big (Accounting) Data demands grow. 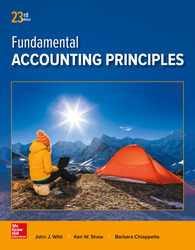 Four unique decision-making features are integrated throughout each chapter to highlight the relevance of accounting in the context of business decisions. -Superior Learning Package – Whether you are a seasoned instructor or a first-time user, a full suite of vetted instructors’ materials, including explanatory solutions, additional exercises, PowerPoint solutions for exercises, algo and static test-bank questions, General Ledger Problems, Excel simulations, and more, will save you time and help you manage your course. -Connect Learning Platform –All the learning resources for Fundamental Accounting Principles are available in Connect: an adaptive eBook, practice and homework assignments, and student and instructor progress reports. Students can also choose to upgrade Connect with a loose-leaf print option depending on their learning style.